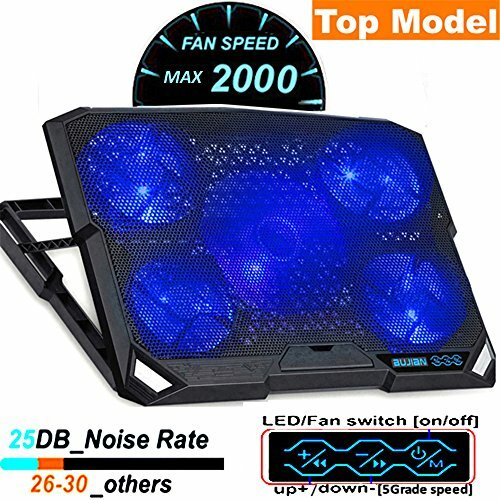 Still Looking for LAP USE cooling mat , why not try this FIVE FANS item at 2fans price in local store ? 5Fans spinning at so strong movement 1000-2000RPM provide superior enough airflow at whisper quiet noise levels . This good air flow allowing you to work all day without making any noise and interrupting your flow. The cooling pad is powered by Laptop. Just plug the USB into laptop and it will work, no other install files needed. Barely over an inch of thickness and only 840g / 1.85lb of weight, It is ultra-portable and protects your investment wherever you go. With the help of ergonomic adjustable height setting design, It provides you with the most relaxing incline angle for all-day viewing and tying. Need extra USB ports while using this 13"-16" laptop cooler? Just plug it into the extra USB port on the laptop cooler. Product Size: L15" * W11" * H0.99"
[ Unique flip-up stopper for 17inch laptop flipping ] Adjustable Non-flimsy carrying capacity for laptops is due to its silicone padded platform/base and Flip-up stopper in front can stops 17inch Laptop flipping when u tilt it. .
[ LED/Fan switch to extend laptop lifespan ]:Just one slight touch to turn off all "LED GLOW" and all 5fans. and the speed can be adjustable in 5Levels so it can extend battery and laptop lifespan largely. [ Comfort 5Levels feet stand ]:Adjustable 5Levels-Stand(10deg each) ensures A better visual or typing angle to relieve wrists&shoulder aching. MORE AIR is pulled from backside gap,and u can apprantely feel the air going through the pad holes. If you have any questions about this product by ThreeLeaf, contact us by completing and submitting the form below. If you are looking for a specif part number, please include it with your message.